Laser-cutting out the rivers on the rear minimized burn marks on the finished front, but did take some time to ensure the two sides would line up perfectly. To prevent the epoxy from bonding to whatever he was working on, [i-made-a-thing] used a melamine cutting board with a coat of Vaseline to allow for easy separation. 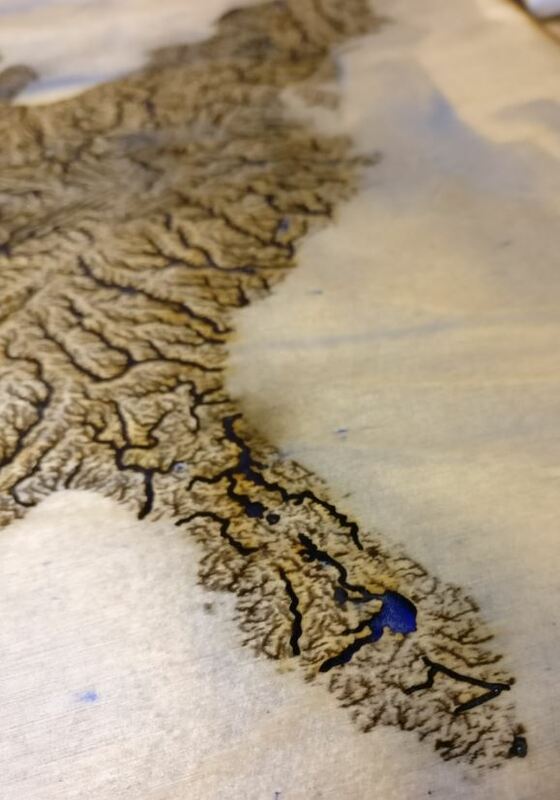 Pouring the epoxy in two passes and using a lighter to pop any air bubbles, he ended up having to sand off the excess from the map’s surface, vowing to tape-off any sections not meant to be coated in the future. [i-made-a-thing] framed the map in stained plywood, gluing the two together before applying a final clear coat of epoxy to even out the finished look. Sticking in the LED strips revealed light bleeding through some parts of the map, which thick cardstock put a stop to. The finished product — bordered by light — is a beauty to behold. As far as maps go, we’ve featured some laser cut jems before, as well as a Marauder’s Map for Manhattan. Neat idea and very well executed. Electronics hacking is mostly a pure technical endeavor. We would benefit by learning from artists as they approach problems from the other end of the spectrum, creativity and independent thinking. The artists I’ve been around do some impressive copper etchings with techniques foreign to us. Have always thought that a talented artist would be the best choice to collaborate with for new and simpler home pcb fabrication methods. Might be hard though, mixing a bench tech with someone that dips eels in paint to create a painting on canvas spread on the living room floor. A little disappointed that you didn’t include the etsy store link; a PhD student who makes the actual art, and clearly linked in the instructable. Beautiful “scientific-derived” art; the city road and building patterns are ripe for a marauder’s map redux. What happened to the Rio Grande from El Paso to where the Pecos River joins it in Texas? Other than that minor detail, pretty nice! 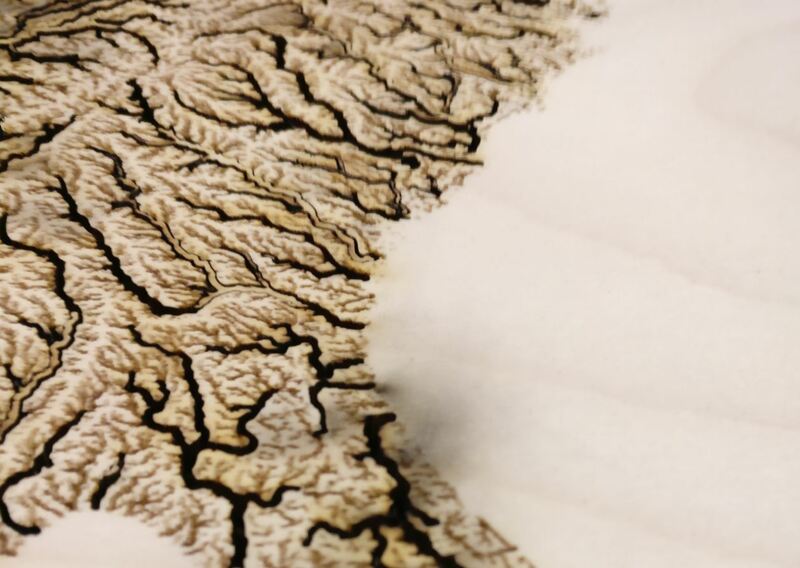 There is a physical analogy – a Lichtenberg figure is caused by charge flowing out of a body instead of water flowing off a surface – but of course the landscape influences the flow of water, just as the flow of water influences the landscape. 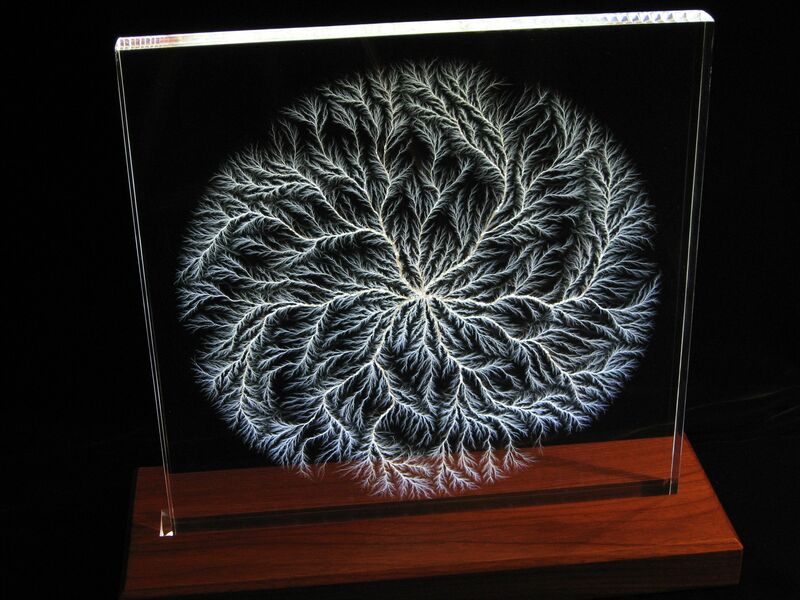 It’s like a lichtenberg figure. Looks a bit scary, might be used as a intro for a spinoff of ‘the strain’.